Cooking is relatively easy. Listening is hard. I have always wanted to be a better listener to others. Time and time again, I fail rather miserably in that category. Look at me. I am such a chatterbox, word warrior, sentence streamer... that I have to resort to talking to the World Wide Web. Seriously! The advice I have been told over and over again by mothers who have gone before me and reared teens is that the key is: Listen to them. Sheeeeesh. Like I said, this potato and leek galette is easy! Listening... is a challenge. What they didn't say to me is that listening involves hearing what your KIDS' interests are, not what I would prefer discussing. My kids' eyes glaze over when I get tickled by how expertly I diced my onion and want to demonstrate for them my newfound technique. Where is their fascination with my budding culinary talents? My eyes glaze over when I am excitedly approached and eagerly engaged in a scene by scene description of the current novel or heroic deed of "Vorax the Brave" in the latest video game. Whether it be play-by-play of Vorax's escapades within the medieval lands or scene-by- scene of the tortuous struggles by "Saffron the Light" throughout the novel, its not always easy to engage actively in your teens' world of hobbies. But I'm working on it... the "glazed eyes" that is. Video games and fantasy fiction just aren't up my alley! I'm working on being a better listener; just like I am working on mastering recipes that strike my fancy; just like I am working on mastering photography so that one out of 5 photos I submit to food publications don't get rejection e-mails. Anyway, just as I am listening with my eyes to the nuances of light on the tip of a frosted cupcake and with my nose to the just right smell of baking bread, I am working on listening to my teens. Now, a little about this galette. It is delicious. 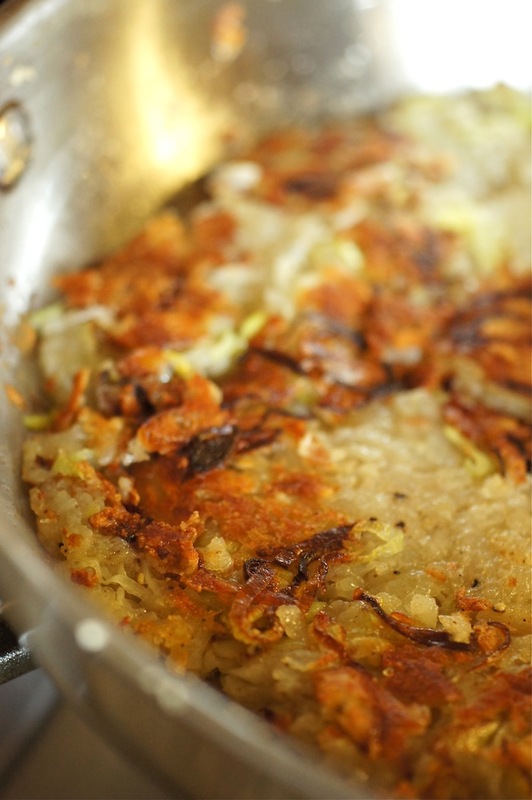 Who doesn't like crisped potatoes and leeks sliced in a pancake round? My biggest piece of advice making this is to be sure (REALLY SURE) that you use a a non-stick pan. Are you listening? Hmmmmm?? If not, return to the top of this article and re-read. I took a risk and thought I could flip the galette easily enough. Nope. Need a non-stick pan. See? I didn't listen! Sigh. This would make a great appetizer for a small group. Its a nice little savory to cut into wedges for a party. The colors are pleasing but the aroma is what is enticing. Enjoy! I'm going to go now and hear what my kids have to say... about Vorax... and Saffron! Place potato in a bowl of cold water, and let soak for 10 minutes. 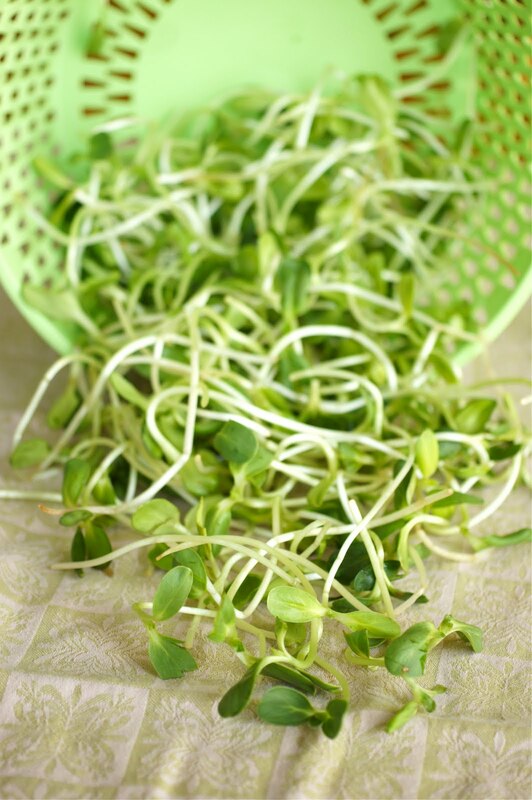 Drain well in a salad spinner or squeeze in a clean kitchen towel to remove excess water. 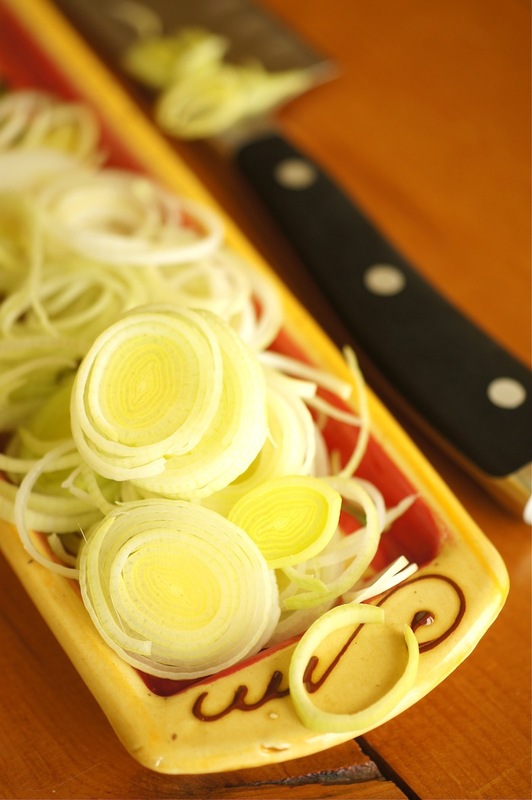 Combine potato, leek, flour, nutmeg, 3/4 teaspoon salt, and 1/4 teaspoon pepper. Heat 2 tablespoons oil in a large nonstick skillet over medium heat. Scatter potato mixture in skillet, and press lightly with a spatula to make sure it holds together. Cook until underside is golden, about 6 minutes. Flip. Raise heat to medium-high. Cook until underside is golden, 4 to 5 minutes. teaspoons oil, and place on top of galette. Slice into 8 wedges.